Illogiblog - The Illogicopedia weblog: So what if I felt like a blog post? So what if I felt like a blog post? BTW, I've taken the incentive and started adding to articles I come across in any way possible, I encourage you to do the same. The Push for Illogicopedian Improvement's going to be having wide reaching effects across the site, so you might as well help out. The forum is awesome people! 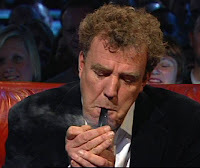 I added a pic of Clarkson... pointless and irrelevant? Maybe, but it looks cooler. Nah it's cool. It works well, how'd you come up with it? Illogicopedia is changing. Don't panic! WTF? No thoughts of the week?